Posted April 26, 2016 by Heather Michet & filed under Healing. Mother’s Day can be a very difficult time for women who have lost a child. No matter the age of the child, how long ago the death occurred, or the manner of death, the emotional turmoil that results for these wounded mothers when everyone else is buying cards and flower baskets to honor moms, is wrenching. 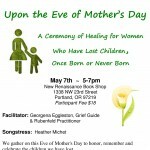 My dear friend and colleague Georgena Eggleston and I will be co-facilitating a beautiful healing ceremony for these moms on the eve of Mother’s Day, May 13th. Georgena is a seasoned Grief Guide, Rubenfeld Practitioner and one who has experienced the shattering grief from the loss of her child. I will be weaving heartfelt song throughout the ceremony to help anchor and enrich the experience in attendees’ hearts and spirits, as well as adding ritual and meaning to the process. Please join us for this transformational evening. Invite other women who you feel can benefit from this gathering and share the flyer freely in your social media and friend/family circles. We look forward to helping women transform their experience of Mother’s Day, this year and for years to come.